Couple of months back I invested in the new Nivea whitening serums which did give some satisfactory results on my skin tone. Walking under the blazing hot Singapore sun barely a year has turned my skin so dark and dull that I knew I have to regain my original skin tone with some combinations of effective whitening products. When I saw Nivea skin conditioner in Caring pharmacy, I knew I simply have to try this. It's a big WOW to lazy mommies like me. I am never a fan of body lotions (even when I was single) because it's a hassle. Now that I have 2 kids on tow, applying body lotion is even a bigger hassle. Skin conditioner is the answer to my laziness! The new skin conditioner by Nivea has nothing to do with whitening but it claims to leave the skin feeling silky soft, with the convenience of using it in the shower. So, that means I can simply slather it all over my body and rinse it off thereafter. No mess and no need to wait for the lotion to be absorbed. How convenient is that? • silky smooth to the touch (when skin is completely dry). • soft? No, not really. More like smooth. • feeling moisturised all over (including hard-to-reach places and butts crack). Okay, that was gross but hey, it's an honest review. • reducing the slippery feeling it gives me after rinsing. • reducing the sticky feeling on my damp skin after towel-drying. • making the skin soft to touch besides feeling smooth. 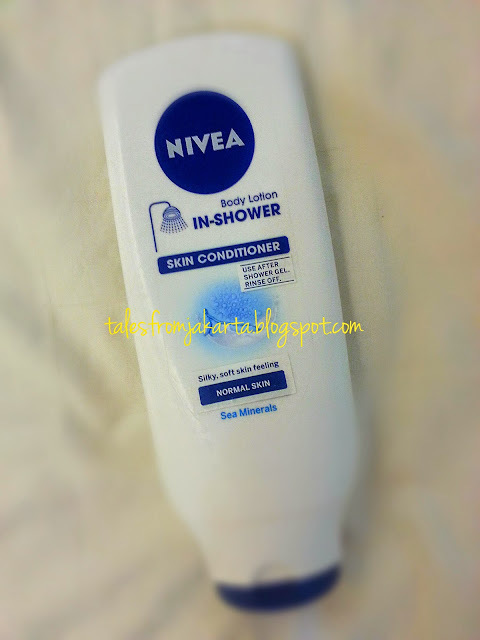 Currently, Nivea in-shower skin conditioner has 2 variations; for the normal skin and dry skin. I will repurchase only if Nivea comes out with whitening variant with SPF for dull skin. Labels: Beautify me, Reviews: Yay or Nay?